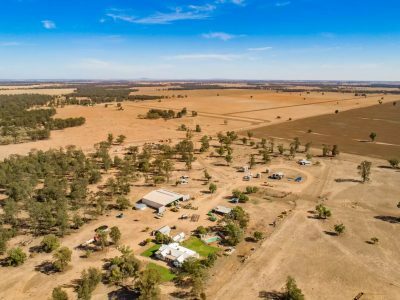 THE listing of Caragabal property Warrakimbo offers purchasers the chance to buy a large-scale dryland-cropping property with a 2000-megalitre irrigation licence in a tightly held mixed-farming district. “It’s certainly a flagship property of the district which has been held by three generations of the Maslin family,” Ray White Emms Mooney agent Ben Redfern said. Covering a total of 3992 hectares, Warrakimbo sits 65 kilometres south of Forbes, and 55km east of West Wyalong. It includes 2400ha of dryland farming country, 1268ha of unimproved grazing and timbered country, and 260ha of irrigation, with potential to develop further dryland and irrigated area. The current owners are ready to plant this year’s winter crop, which will be included in the walk-in walk-out deal. Average yields for Warrakimbo’s dryland wheat and barley crops over the 2016 and 2017 harvests averaged around 3 tonnes per hectare, while canola averaged 1.8t/ha. Warrakimbo has predominantly black and grey self-mulching clays, running to some areas of red loams, and has successfully bred and fattened sheep and cattle under Maslin ownership. The property receives an annual average rainfall of 450-500 millimetres, and its native timbers include belah, myall, rosewood, wilga and box. A bore, equipped with a solar pump provides 20,000 litres per day via a reticulated system which services improvements including stock troughs. The Upper Lachlan Alluvial Groundwater Zone provides Warrakimbo’s irrigation entitlement which is serviced with a bore able to pump 8Ml per day. Warrakimbo has seven dams, and features an additional 400Ml turkey-nest dam to service its four fields which are developed for cotton or other row-crop production. The Maslins have been using their irrigation entitlement to grow winter cereals, and maize and sorghum over summer. Sandhill Plain Creek runs through Warrakimbo, and provides beneficial periodic flooding. Warrakimbo has a 1km frontage to the Mid Western Highway, and is located 13km east of its junction with the Newell Highway. Improvements include a homestead, a four-bedroom home, and a two-bedroom workers’ cottage, as well as a machinery shed, haysheds, steel cattle yards and 192t of vertical grain storage. Warrakimbo is listed for sale by tender, with offers to be lodged by 5 June, and two options exist for its purchase. The first comprises 2623ha, including the irrigation and licences, with no improvements, while the second covers the entire property with all improvements.